With its scenic African plains teeming with astounding wildlife, plenty of game-viewing opportunities, wealth of accommodation options and unique activities for every traveler plus seven UNESCO World Heritage Sites, Tanzania has always been a popular and arguably the quintessential safari destination for many decades. Because there is so much to see and experience, Tanzania safari has been classified into 2 parts: Southern vs Northern Safari Tanzania Circuits. Safari parks in the southern circuit covers Selous Game Reserve, Ruaha National Park, Mikumi National Park, Udzungwa Mountains National Park and, although a bit on the eastern region than the south, Saadani National Park. To reach this part of Tanzania, the common entry point for visitors is Dar es Salaam. Considered Tanzania’s hidden treasure, Selous Game Reserve lures travelers who are into a more intimate and raw African experience. It is one of the largest faunal reserves of the world covering a vast 50,000-square-kilometer area that is relatively undisturbed by human impact, and it also home to one of Africa’s last significant populations of endangered wild dogs. 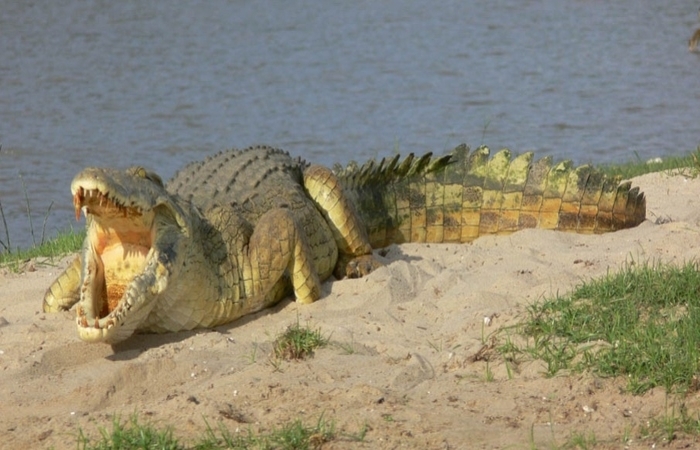 One of the main highlights in this park is the Rufiji, Tanzania’s largest river, and since there are many adjoining rivers and waterways surrounding the area, elephants, giraffes, hippos and crocodiles are a common sighting in the park as well as black rhinos and cheetahs. 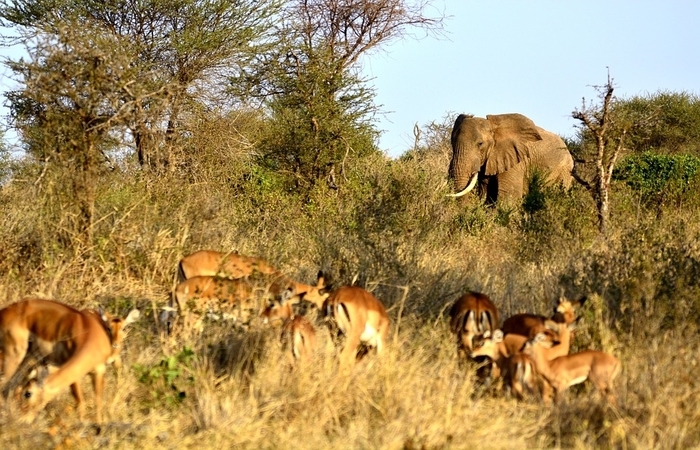 Hailed as the largest park in Tanzania and East Africa, Ruaha National Park encompasses a vast 20,226 square kilometers of savannah containing globally significant population of lions and elephants. In fact, it holds 10% of the planet’s lion population. 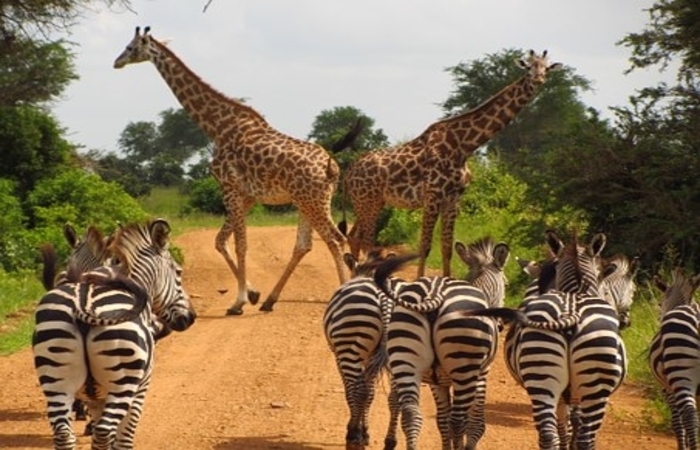 Mikumi National Park has grown to be an even more tourist-alluring attraction since its road improvements connecting Dar es Salaam. Lying astride the main highway to Zambia and en route to the National Parks of Udzungwa Mountains and Ruaha, Mikumi National Park is the closest southern safari circuit to Dar es Salaam. 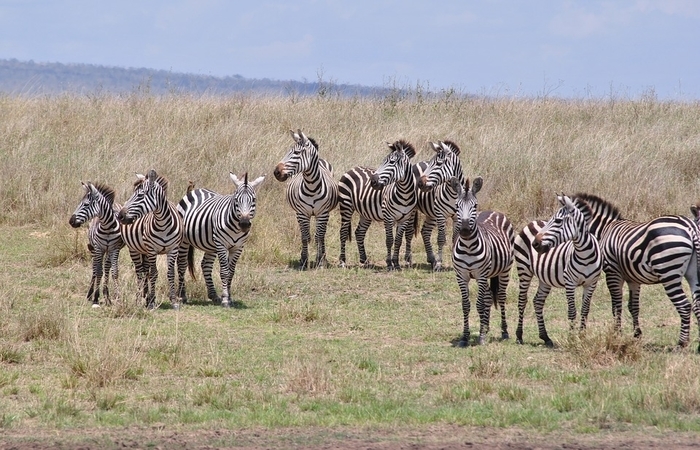 It is the fourth largest park in the country and it features a lot of wildlife including elephants, buffaloes, zebras, wildebeests and giraffes. Stretching across the Eastern Arc mountain range, Udzungwa Mountains National Park offers a diverse landscape composed of tropical rainforest, mountain forest, miombo woodland, grassland and steppes. It also features a gorgeous display of wildlife supporting mammals like buffaloes, leopards, elephants, elands, some lions and African wild dogs as well as 6 primate species. 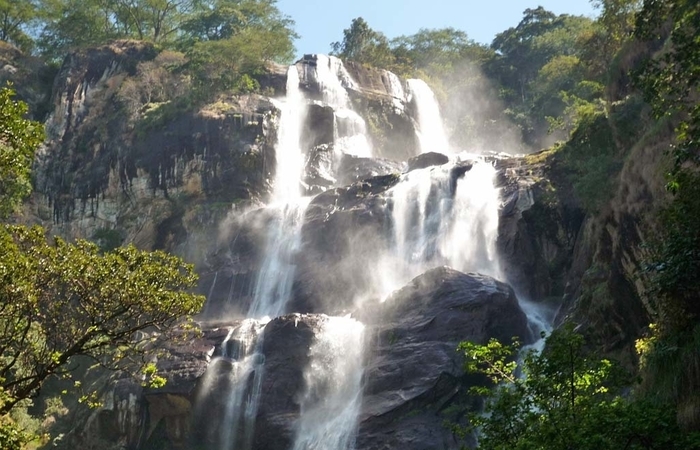 Although not a primary safari destination, Udzungwa remains a magnet to hikers as it features beautiful landscapes and it only takes about half a day to reach the majestic Sanje waterfall. 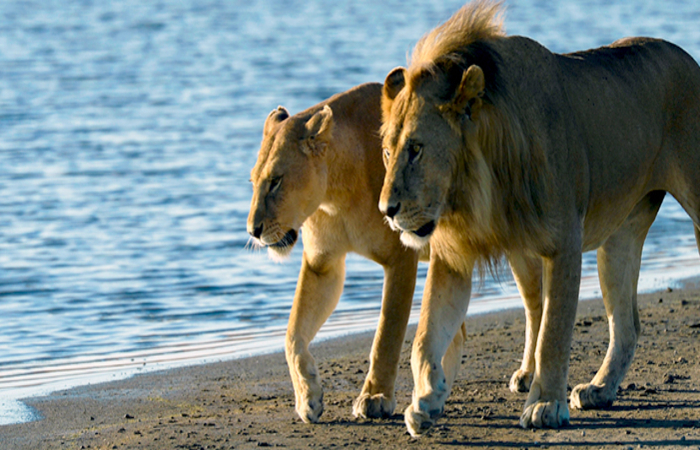 Saadani National Park is the only wildlife sanctuary in Tanzania bordering the sea. It is habituated by many marine and mainland animals including hippoes, giant kingfishers, waterbucks, wildebeests, buffaloes, giraffes, lions, warthogs, baboons, hartebeests, reedbucks and colobus monkeys. You can also find lions, leopards and elephants in the park although they are a bit shy. When it comes to vegetation, Saadani offers a plethora of them ranging from mangrove forets, black cotton plains, short- and tall-grass savannah, river, ocean, clump of palm trees and even a magnificent coral wilderness in the Indian Ocean. Activities in this park include game drives, boat safaris, walking safaris accompanied by an armed ranger, historical tours, cultural tours, camping and even swimming in the beach. The northern safari circuit is most frequented by tourists and is usually the top choice for first-timers. It includes many famous parks including the world-renowned Serengeti National Park, Ngorongoro Conservation Area, Tarangire National Park, Lake Manyara National Park, Kilimanjaro National Park, Arusha National Park, Lake Eyasi, Rubondo National Park, Lake Natron and Lake Victoria. 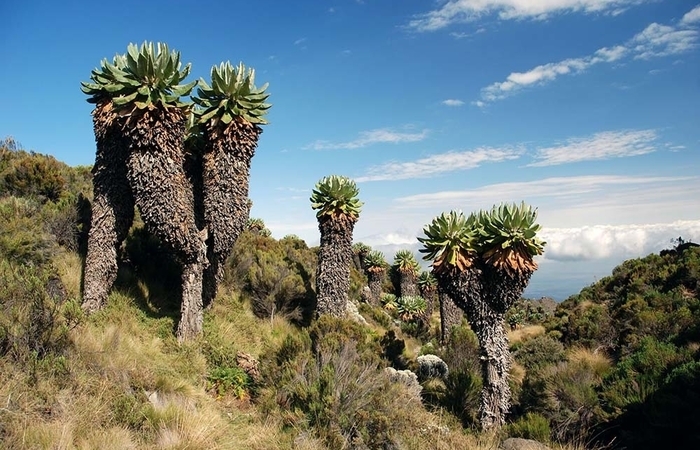 The gateway to these parks is Arusha, which is served by Kilimanjaro International Airport (JRO). Almost everyone who has ever planned a safari knows about Serengeti National Park. How couldn’t they? 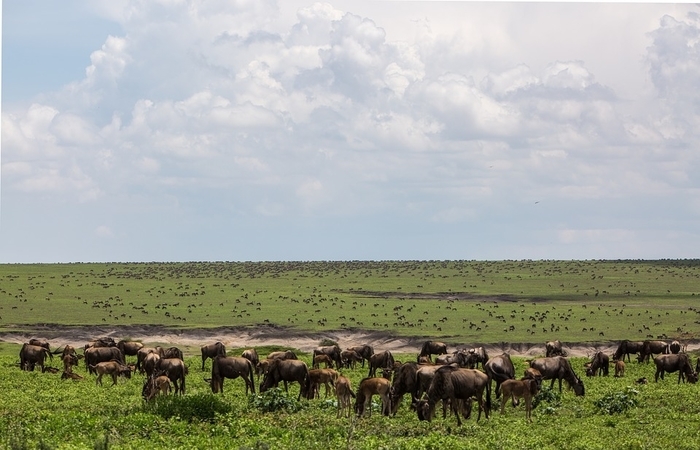 Serengeti is the home to the world-famous Great Wildebeest Migration, one of the world’s largest animal migration and coined as the world’s greatest show. Every year, over 2 million wildebeests, zebras and gazelles stampeded across the East African plains in search for grazing. They go through a cycle as they migrate from one place to another, struggling to survive despite the wild predators lurking around. The Maasai called the plains of this park “the place where the land moves on forever”. True to its name, Serengeti National Park features a breathtakingly vast plains, a spectacular diversity of landscape and animals, and an overwhelming wildlife concentration. Ngorongoro Conservation Area is another World Heritage Site. Its star attraction is the Ngorongoro Crater, an extinct volcano known as the world’s largest inactive caldera and often compared to the Garden of Eden. This wondrous site is home to the densest concentration of wild animals in Africa. The beauty of it is, all major animals (including the Big Five) are easily seen – anytime of the year. The only animal you would probably not see in the Crater area is the giraffe due to the steep descent. However, you can easily find them around the Crater area. Also, black rhinos are not easy to spot in Tanzania because they are very shy, but in Ngorongoro Conservation Area, these animals can be easily spotted. 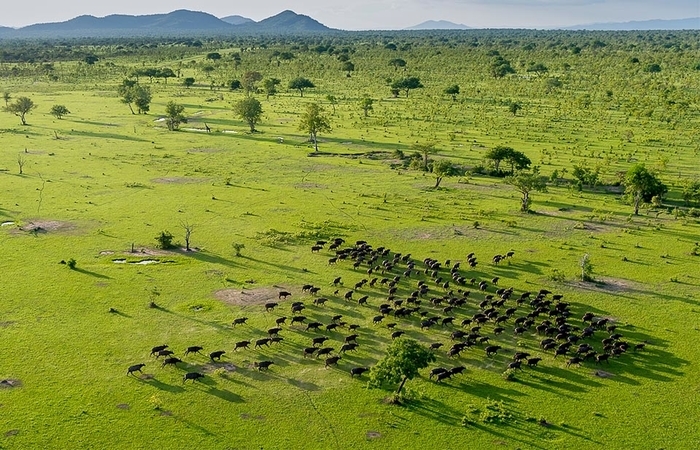 Considered one of Africa’s most underrated parks, Tarangire National Park is a 1,100 square-mile park that’s famous for the tree-climbing lions, massive herds of migrating elephants and a fine diversity of other large mammals. Among the many animals you can find in the park, you can also expect to see plenty of zebras, Cape buffaloes, wildebeests, waterbucks, giraffes, impalas, some vervet monkeys, olive baboons and gazelles. When one thinks of Lake Manyara, one instantly imagines a vast soda lake filled with pink! 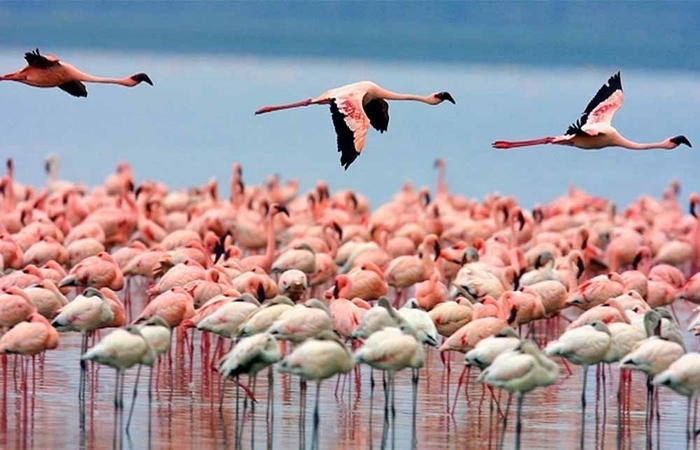 With thousands of vibrant flamingoes (both lesser and greater) flaunting their pink feathers in front of the white rhinos, zebras and other fascinating species around the soda lake, Lake Manyara offers a scenic view everyone craves for. Although not a primary safari destination, this park is a perfect day-tour destination. 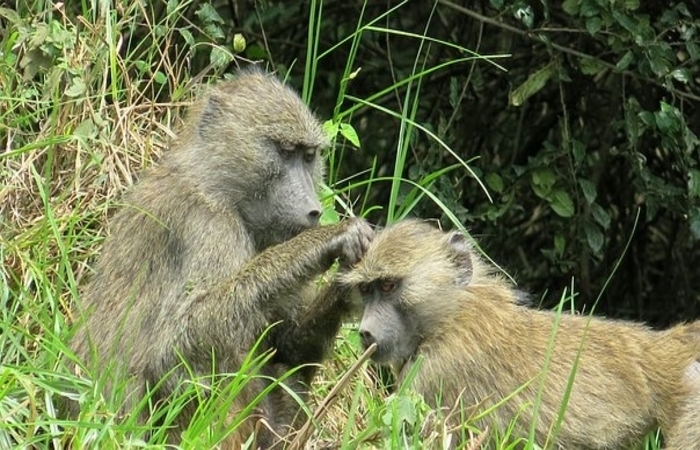 It is home to the largest concentration of baboons in the world and it remains one of Africa’s best birding destination. Unique activities that can be done in this area includes night game drives, mountain biking along the lake and a visit to a local village. Kilimanjaro National Park is habituated by tree hyraxes, grey duikers, rodents, bushbucks and red duikers. In its montane forest, you can also find Cape buffaloes, blue monkeys and western black/white colobus monkeys. Other wildlife in this park include elephants and leopards. But, the heart and main attraction of this park is, of course, the magnificent Mount Kilimanjaro. Aside from its snow-capped peak which is often photographed by many tourists from around the world, the mountain offers impressive views from above and also features beautiful waterfalls: Kinukamori and Materuni. For adventure-seekers who want to climb this towering beaut, there are at least 6 routes to choose from – ranging from 5-day treks to 10-day treks. Arusha National Park is Tanzania’s most accessible national park. It is just a short drive from Arusha or Moshi and so it is perfect for a day trip or as a first or last stop on a longer itinerary. The park is small but varied, with wildlife such as elephants, hippos, buffalos, zebras and sometimes also wildebeests. It is home to world’s largest population of giraffes and it is also where you can find Mount Meru, a prominent volcano that stands at 4566m. 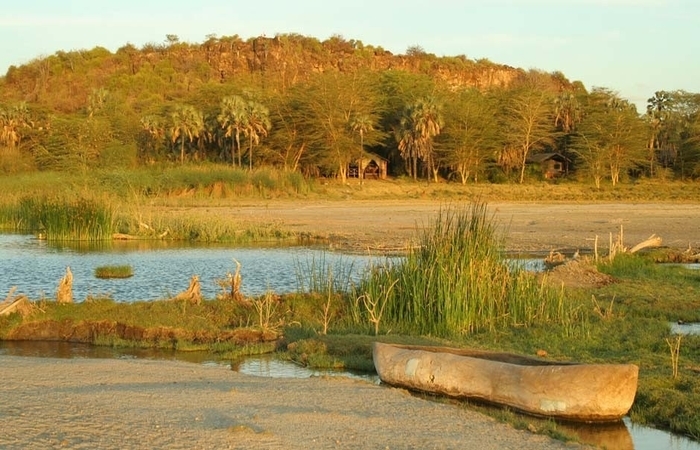 Home of the Hadza tribe, Lake Eyasi is not a primary area for wildlife but you can still find quite a number of animals in there, such as antelopes, monkeys and hippos. It features a seasonal shallow salt lake that’s located in the floor of the Rift Valley, and it has a very hot and intense weather all year-round. What makes it distinct among the other safari destinations is that it displays gorgeous tropical touches such as palm trees around the lake, umbrella thorn acacias and even sand paper bush. 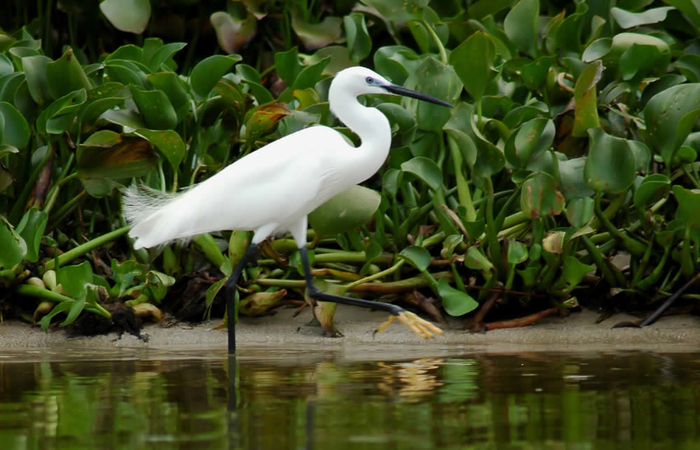 Attracting only a small number of visitors each year, Rubondo National Park remains one of the favorite places of fishermen and birders. It is an important breeding ground for migratory birds and fish species like Tilapia, and with 80% of the park covered by a dense forest, Rubondo gives haven to wild creatures such as bushbucks, genet cats, spotted neccked otters, hippos, sitatunga, crocodiles, elephants, chimpanzees, vervet and colobus monkeys, grey parrots and giraffes. Also, it offers a fascinating view of Lake Victoria. 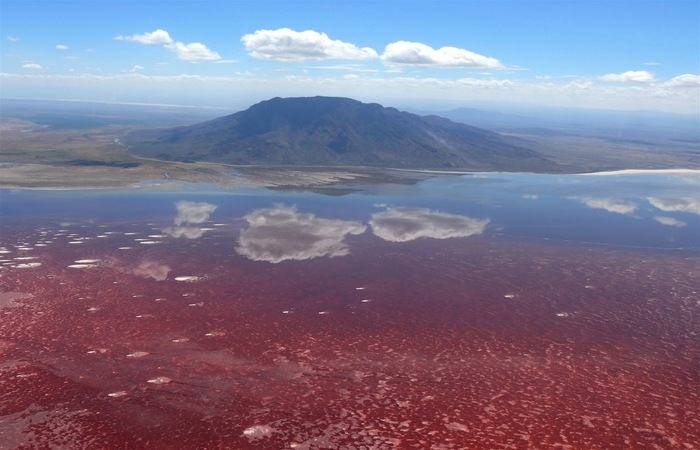 Lake Natron is a soda lake with an alkalinity of more than 12 pH. It displays a salt crust that’s sometimes colored orange, pink or red. This color is due to the microorganisms that live there. Surprisingly, it remains a safe breeding ground for lesser flamingoes. Although not particularly a wildlife destination, the scenery is what attracts most visitors the most. 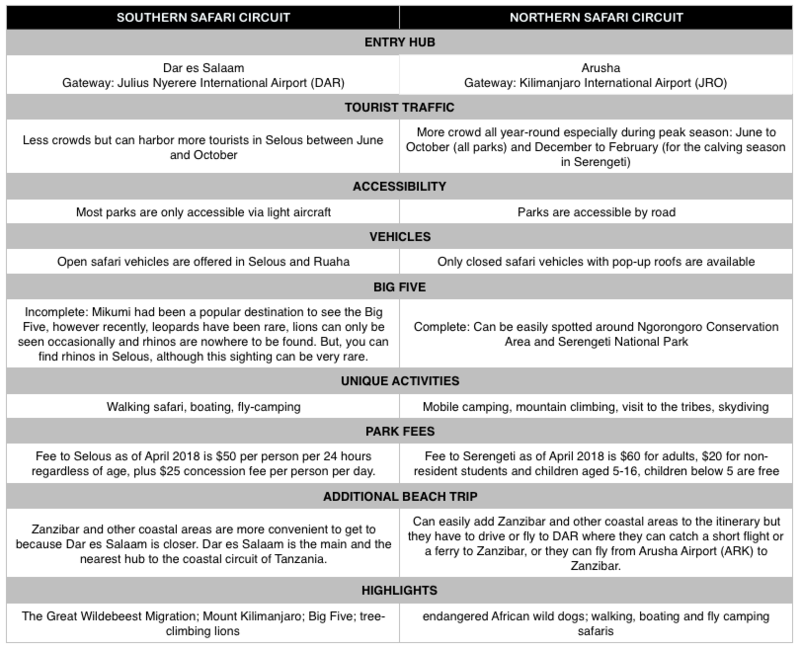 Considering all the pros and cons, both circuits really offer remarkable safari experiences. But it entirely depends on the type of adventure you are looking for. If you are more into a remote safari experience who’s also looking into doing some hiking, boating and fly camping, southern safari circuits is perfect for you. If you are more into “postcard Africa” traveling, the Great Wildebeest Migration, the Big Five and you don’t mind sharing the space with other tourists, northern safari circuit will definitely be a sound choice. Besides, these two circuits are not mutually exclusive so you can always combine the two. Previous postSouthern Africa vs East Africa – Which Has the Better Safari?